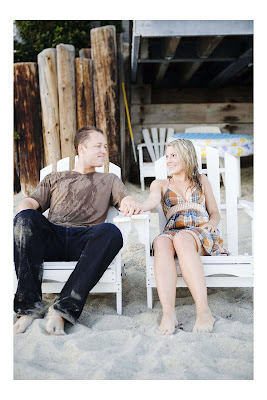 Ashley and Tyson (Tashley) are getting married in January at the Ebell Club in Long Beach. These two booked by a LONG time ago. I think it's almost been a year. So, I was really excited to shoot their engagement pictures. Besides being clients, I've gotten to know the two of them through mutual friends over the last year. 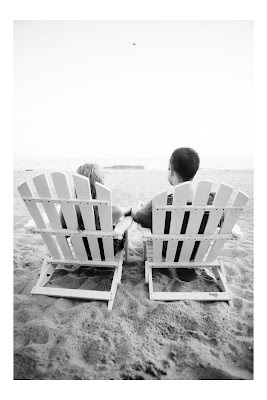 Whenever I shoot at the beach I always warn my couples that they will get wet. I have them bring towels and a change of clothes just in case. Well, the tide was quite high last week. Higher than I've ever seen it before. The beach that I normally shoot at was nonexistent. We braved the big waves and Tyson and I each got hit once, but Ashley was fine. I sat the two of them on a rock way far away from where the waves were crashing and all of a sudden a freak rogue wave comes out of nowhere and collapses on top of the two of them. I don't know how it missed me and my camera, but I didn't get wet at all that time. I felt so horrible, but they were laughing. So, what did I do? I kept shooting. It was too funny! And here's a shot right after the wave. At least they are laughing! I'm glad Ashley and Tyson have a good sense of humor! They still looked totally gorgeous soaking wet so we kept shooting and we got some good pictures. I'm so excited to work with these two again in January! Here's the slideshow!